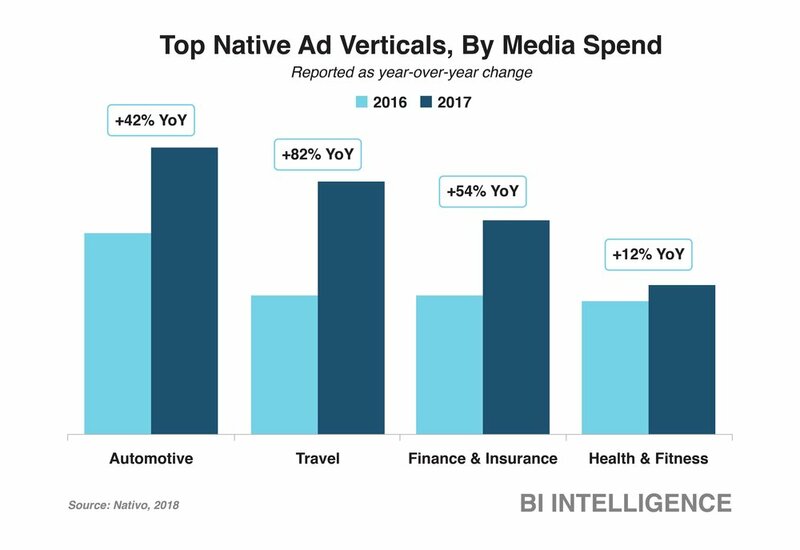 Business Insider | April 4, 2018 - Advertisers opted to invest more heavily in native ad formats in 2017, according to a report by native ad-tech platform Nativo. Native ads, which include sponsored content, replicate the look and feel of the content surrounding them. Nativo found that native ad spend increased across nearly every vertical of the 600 brands it serves. This shows that digital advertisers are leaning more heavily on native ad formats — native ad spend across formats increased 500% from 2014 to 2016, according to an earlier Nativo report. Automotive generated the most native ad revenue and grew 42% YoY. Travel was the second biggest vertical, growing 82% YoY. Finance & insurance came in third with 54% YoY growth. Health & fitness was the fourth biggest vertical, growing 12% YoY. The growth in native ads signals that more brands are looking to avoid poor user web browsing experiences, which traditional nonnative ads contribute to. The majority of US consumers now want an improved web browsing experience — 51% of Americans believe websites should cut down on their ad loads, according to a separate March 2018 survey by Instart Logic. Moreover, nonnative ads, like pop-ups and large banner ads, can cause websites to crash, leading to negative consequences for companies; 36% of US consumers said they'd never visit a mobile website or app again if it crashed, per Instant Logic. And brands should continue to invest in native ads because it may become harder for nonnative ads to reach web users. Wells Fargo and Optimal.com forecast 100 million consumers in the US will be ad-block users in 2020, up from 44 million in 2016, per Business Insider Intelligence. Moreover, Google started rolling out its ad “filter” equipped Chrome browser in February, which blocks ads deemed to provide bad user experiences. Native ads, however, are less susceptible to being detected by ad-blocking software. A growth in native ads is in line with Business Insider Intelligence’s bullish stance on native ads: We predict native ad revenue will make up 74% of total US display ad revenue in 2021, up from a 51% share in 2016.
Business Insider subscribers can read the full article by clicking the button below.